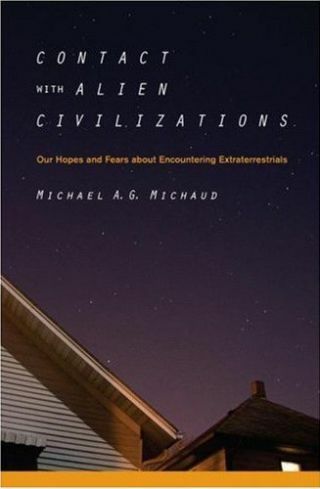 Author Michael Michaud tackles how humanity should handle close encounters in his book "Contact with Alien Civilizations – Our Hopes and Fears about Encountering Extraterrestrials." High-techtelescopes on the ground and inspace that perform daunting astronomical peep shows in a search for Earth-likeworlds aim to answer one of humankind's most monumental questions: "Are wealone?" Arguably,a more pointed question might be: "Just how crowded is it?" [video]. Thereis on-going deliberation relating to the societal, philosophical and religiousfallout that stems from resolving such a stellar inquiry. MichaelMichaud is the author of a newly published exceptional book, "Contact withAlien Civilizations - Our Hopes and Fears about EncounteringExtraterrestrials" (Copernicus Books). He suggests that the "primequestion" is straightforward: Should we simply be watchers and listeners fromour outpost in the universe, or should we actively seek contact by sending outmessages, proclaiming our presence? Asthe book suggests, our answers to those queries expose both our desires andqualms about encountering extraterrestrials(ET).Additionally, contact may not lead to a Woodstock of the skies...nor does itimply Armageddon either. Inwriting the book, Michaud told SPACE.com that his research led toseveral realizations. For example, he said that the debate has been dominatedby supporters and opponents of one scenario: remote contact through radiosignals. "Asmy book points out, that is far from being the only possible model of contact.Secondly, I became increasingly convinced that non-science, non-technologyfactors such as motivations and ethics may be crucial for the outcome ofcontact," Michaud said. Michaudsaid that he was struck by the centuries-old dialogue between belief andobservation that got under way with Galileo Galilei, the 17thcentury Italian astronomer and physicist. "Sciencehas steadily improved our perceptions of the physical world, but still isunable to answer some basic philosophical questions. Some day, science maybe able to answer questions now in the realm of belief, but we aren't thereyet. Both science and belief have roles to play, though the dialogue willbe fruitful only if both sides show tolerance and civility. There is noplace for arrogant assertion when so little is known," Michaud said. Isit time for the U.S. Congress to re-look at the ET encounter business -given the increasing rates of extra solar planetary detection? "Idoubt that an initiative to restore NASA funding for SETI would succeed in thepresent environment, particularly when NASA is cutting funding for spacescience projects," Michaud responded. "In my view, we need to broaden ourapproach to encourage related activities that might produce serendipitousresults, such as expanding funding for extrasolarplanet searches." Moreover,Michaud suggested that there's need to address the possibility of an artifactsomewhere in the solar system -one that could have ceased operating millions or billions of years ago. Perhapshaving served as Director of the U.S. State Department's Office of AdvancedTechnology and as Counselor for Science, Technology, and Environment at theAmerican embassies in Paris and Tokyo, Michaud served up a proposal. "Havesome authority, such as the White House Office of Science and Technology Policy,send a reminder to agencies that do space-oriented research, reminding themthat peculiar phenomena they detect might be evidence of extraterrestrialintelligence. This should include security-oriented agencies that shallremain nameless here." Inhis new book, Michaud spotlights the fact that, for many people, ET contact inone form or another now seems likely, but at some unpredictable time in ourfuture. Still,is the often cited societal grasp and gasp that "we're not alone" an overblownaxiom - perhaps akin to a puffed up cosmological rapture of the deep? Could itbe that the general public, in learning such news, might not be able toappreciate the magnitude of such a confirmation? "Whilemuch of the public takes the existence of extraterrestrial intelligence forgranted, the impact of a detection could vary considerably, depending on thescenario of detection," Michaud said. "Inthe case of a remote signal," Michaud added, "my view is that it isunlikely to be a message...it would be contact without communication. If wefind an artifact in or near our solar system, the impact could be muchgreater." Asto the societal shockwave of detecting ET, there are those that suggest thatthe impact won't vary too much. That's because the scenario of detection issomewhat guaranteed to follow a pattern of unfolding actions. Inthat camp is SethShostak, senior astronomer at the SETI Institute in Mountain View,California. Firstly,someone, somewhere will hit upon a signal that -- at least at first -- appearsto possibly be extraterrestrial, Shostak said. "Maybe that person is doing aSETI experiment, and maybe it's the unexpected result of a more conventionalastronomical observation. Perhaps it is even a hoax. But in any case, thestory begins to get traction when the claim is made." Whathappens next is that the SETI community, and possibly others, would swing theirtelescopes in the direction of the suspected source, Shostak continued. They'dget busy trying to ascertain whether this is really ET on the line, or simplysome unrecognized, at least by the finder, terrestrial interference - say a chattycommunications satellite. "Itwill be days and days before researchers would feel convinced from theirobservations that the signal is truly extraterrestrial," Shostakemphasized. "That's the amount of time it would take to reconfigure theinstruments...to follow the source...and to establish its position, frequency driftand other parameters that are relevant to deciding 'this is someone on anotherworld.'" Shostaksaid that while all this was going on, the media would be covering thestory. "We know this from experience. There is no secrecy...and nochance of secrecy," Shostak noted. Furthermore, the public will be interested. "Afterall, this is a front-page story. But they won't be rioting in the streets,or even scared, I would venture. Picking up a signal is not a danger. Thealiens don't know we've done it [detected their signal], and they're highlylikely to be 500 light-years away or more." Lastly, Shostak pointed out that, eventually, scientists will say that they are"99 percent certain" -- or whatever -- that they have found a signal comingfrom intelligence elsewhere in the cosmic neighborhood. "Ifit's a radio signal, there probably won't be any easily detectable information.That requires a different instrument," Shostak said. "So it's unlikely that we'llhave the 'bits'...we won't know what they're saying. Merely that they are on theair." Asa result, the ET revelation will be the leading science story of the year. Somewould say of the century, Shostak predicted. "The public will be enthusedor otherwise, depending on how they view the news of another world withthinking beings. But just as Europe was changed -- but did not panic -- whenthe New World was found, so will we be changed...but philosophically, and at arelatively slow pace," he concluded.